We’re all in favor of urban density, but why do we need a skyscraper that’s a mile high? Saudi Arabia-based Kingdom Holding Company, headed by Prince Al Waleed Bin Talal, has given the green light to build a 1 mile high tower in the Red Sea port city of Jeddah. Designed by Adrian Smith of Adrian Smith + Gordon Gill Architecture, the “Kingdom Tower” will be twice as tall as the Burj Khalifa, include 12 million cubic feet of space and it will take 12 minutes for a regular elevator to reach the top! We’re flabbergasted. What, your for density and now your against it. Density is a matter of opinion. I doubt the tower will have a huge market. Probably cheaper to build smaller somewhere else. No one at Inhabitat will be happy until Earth looks like Coruscant. Because it can be built. That is why. We're all in favor of urban density, but why do we need a skyscraper that's a mile high? Saudi Arabia-based Kingdom Holding Company, headed by Prince Al Waleed Bin Talal, has given the green light to build a 1 mile high tower in the Red Sea port city of Jeddah. 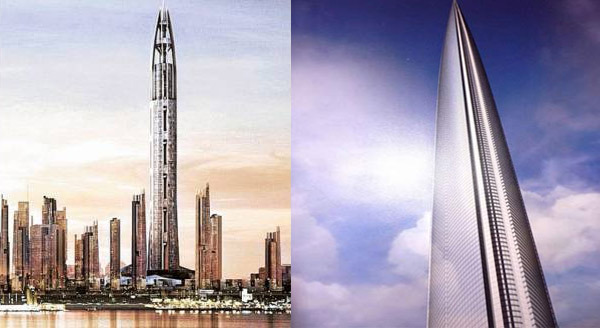 Designed by Adrian Smith of Adrian Smith + Gordon Gill Architecture, the "Kingdom Tower" will be twice as tall as the Burj Khalifa, include 12 million cubic feet of space and it will take 12 minutes for a regular elevator to reach the top! We're flabbergasted.